Should Bells patent for the telephone have been granted? for the telephone have been granted? The one that didn't work? 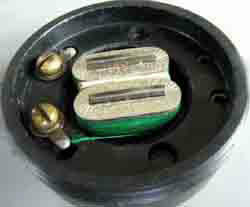 A second version with a lighter armature, a small metal diaphragm was made from the first set of parts plus changes. It seemed to worked for Watson but when Bell tried it didn't work. At this time Hubbard one of Bell's financial sponsors interfered and discourage Bell in any further work on the telephone until he had finished with other inventions. Should Bell apply for a patent with this "questionable" level of verification? Bell decides with these questionable results and without any further improvements or experiments to go ahead and apply for a patent! 8 months later! March 7 1876 Bell was issued patent 174465 on the telephone. Within days after the patent was awarded Bell goes back to the lab to make his telephone work! But even then did it work? IT sort of did, at least for relatively small distances. It took the work of Edison with his carbon transmitter and induction coil to make telephone work over commercial and domestic distances. 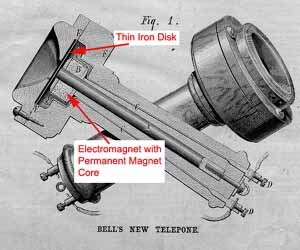 So in the end only after Bell's patent covering the magnet receiver was married to Thomas's Edison's patent covering the carbon microphone and induction coil 1878 did the telephone really became the "TELEPHONE". Another interesting tidbit, during this time in late November 1877 Edison invented his phonograph. What would it have taken to make one work before the patent application? We critiqued the design then built one with out the weakness Bell had in his model. We copied most of the parts used in Bells 1st design. We did not use the membrane but added a thin soft iron disk and a permanent magnetic field to the core. We used the same frame. The instrument we built is compared with Bells in the pictures shown below. It took less than three hours of shop time and it worked. Our Gallows telephone design used fewer parts with the same mechanical layout in Bell's design, but we made sure that the magnetic field was much more concentrated. We found that there were minimal design and shop work changes to build a suitable demonstration instrument for sending speech over wires. Why didn't Bell use this design in the first place? He used it later. Why did he the get the patent? 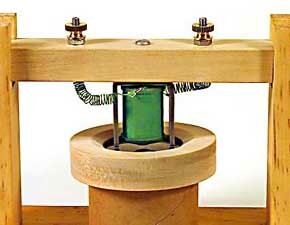 Bell apparently did not understand the management of magnetic fields around electromagnets nor simple electrical laws of electromagnetism even thou there were working examples around him that he was handling nearly every day which included the features he needed for a successful telephone. 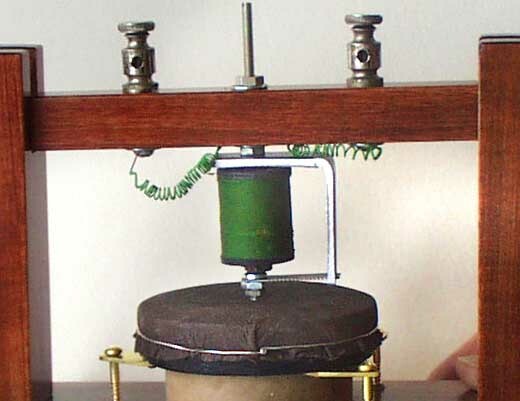 For example he had telegraph relays and sounders all which were designed with the efficient treatment of magnetic fields, a thing that he definite lacked in his earliest design. Perhaps the patent office was not aware of this. As to getting the patent with so little to no confirming tests results. This is very difficult to ascertain. We find from our literature search, suggestions with very little proof, that there were many questionable activities going on in the background at the patent office between sponsors, lawyers, inventors, and patent staff. Another good question to ask. How do inventors make their inventions work ? and did Bell do things differently? Most scientist and inventers work along the same route, that is they gather the work and discoveries of others and try this and that until something clicks almost by accident. I have seen and been apart of groups of scientist engineers working on the same problem when this CLICK happens! It happens to almost every member of the team within a second or two of each other, certainly within a few days. Bell like most inventors made use of and built on other peoples ideas to create a design that ultimately worked. The question then we must ask is. Who, of these others, should have been included on the patent? Bell certainly was working in a group, not always in a legal contract group but a group nevertheless. He was communicating with Henry (one of American greatest scientist on magnetism) other telegraph inventors, people at Williams's shop who were working on all sorts of telegraph ideas, Watson who was constantly going to library looking at the scientific and engineering literature. So who gets the prize for this invention? The one who talks or writes the fastest and gets the idea out on the table first ? Or is it the one in control like a leader? In this instance Bell was the tech leader and its well documented the Watson was a very active contributor. 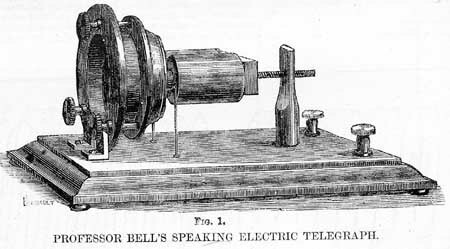 Now after looking at the perspective described above, was Bell really the inventor of the telephone? Again when he submitted his application he did not have proof that his invention worked. We built, for this project, an instrument to get this proof. It was easy to design and build. We used parts that were readily available to Bell. A good question is why didn't Bell use this or a similar design for his first instrument? ironically shortly after he received his patent he did use this design and presented it at the Centennially Celebration in Philadelphia. In the end the courts decided that Bell was the inventor and some would say 'That that". But one could rebut, that few if any judges, lawyers, or juries understood enough about the scientific principles that one needs to make this judgment. So it could be that Bell was awarded the patent because the system didn't have the skill set to make the correct judgment? Or could it be that he was the inventor with the most and best lawyers and no one at the time really cared to go to the expense of getting the patent reversed. From this story perhaps we should be asking ourselves about the present patent and scientific award systems. They are very much the same today as in Bell's time. We haven't done much about recognizing the TEAM effort? Each team member may be in different part of the world and communicate by word of mouth, writing, telegraph, telephone, internet, etc etc and the communications maybe years months days hours or second apart but they all contribute. Discoveries and inventions are always through group efforts. "THE INVENTOR, THE SCIENTIST" ? Bells first telephone design. It did not work and was set aside. Above is what Bells first design might have looked like if he had a better understanding of electromagnetism.. This design works. It was not clear that Bell's did! Oddly enough after he had received his patent on the telephone he put this design into place. It was described in the Oct 6th 1877 Scientific American. The top picture shows a closer view of the more efficient design giving a better path for the magnetic field with the addition of a u shaped piece. He finally gets the message about how electromagnets like to have a return path for the magnetic field. 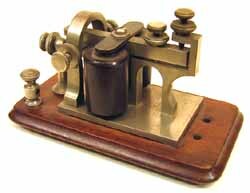 It is surprising how long it took Bell to eliminate the week point in his magnets Again and again Bell was surrounded by examples of completing the magnetic path like the telegraph sounder above but he did not seem to catch on to its importance . It shows a better design that could have launch his patent. Iron disk, permanent magnetic core with coil, and a supporting framework was the way to go! It has a good return path for the magnetic field. It looks like the famous scientist Joseph Henrys comments to Bell was go back and start learning about magnets young man was right on target. As an ironic side comment the U shaped electromagnet design used by Watson in 1877 was still in use in headphones 70 years after the concept was suggested see the picture above. 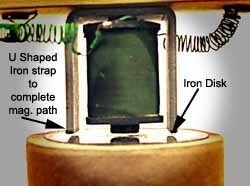 The soft iron disk was taken off so one can the U shaped electromagnet .